Senator Ted Cruz (R-TX) and Rep. Mario Diaz-Balart (R-FL) are introducing legislation calling for the U.S. government to label the Muslim Brotherhood as a terrorist organization. The Texas Senator and Republican Presidential candidate said he is introducing the bill to protect against the “violent jihad” carried out by the Muslim Brotherhood affiliates both in the United States and the rest of the world. “As this bill details, the Brotherhood’s stated goal is to wage violent jihad against its enemies, and our legislation is a reality check that the United States is on that list as well,” Cruz said in a statement released on Wednesday. The Brotherhood is already considered a terrorist organization in Bahrain, Egypt, Russia, Saudi Arabia, and the United Arab Emirates. The Islamist outfit–which was founded in the early 20th century by Egyptian Imam Hassan al-Banna, an admirer of Adolf Hitler and the Nazis–seeks the end-game of a global Islamic caliphate. Yusuf al-Qaradawi, who is currently considered the de facto spiritual leader of the Brotherhood, continues to support suicide bombing operations and terrorist organizations such as Hamas and Hezbollah. He is currently being sought by Interpol on charges of incitement and assistance to murder, assisting a prison escape, arson, vandalism, and theft. The bill also mentions the presence of Muslim Brotherhood front groups in America, and how the Holy Land Foundation trial, which was the largest terrorism financing case in U.S. history, sought to uncover the web of Muslim Brotherhood affiliates in the United States. These groups, which include the Council on American-Islamic Relations (CAIR) and the Islamic Society of North America (ISNA), among others, now deny having a direct connection to the Islamist outfit, but their founding ideals continue to be promulgated in a form that parallels the Brotherhood’s vision. 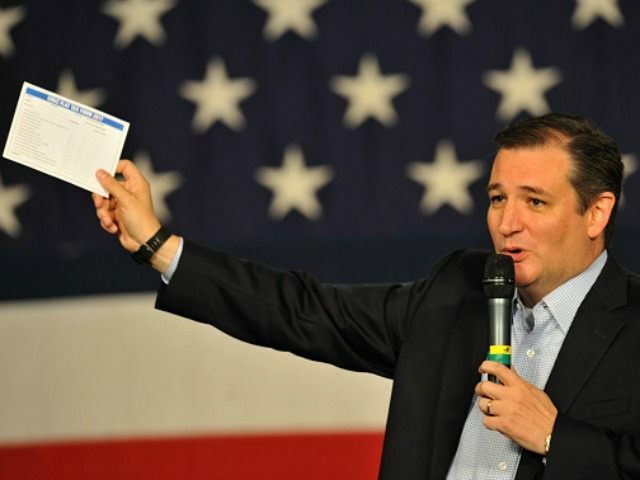 Cruz says it’s time for the entire Muslim Brotherhood be listed as terrorist organization, given the fact that some of its members, which include the Palestinian terrorist group Hamas and other radical entities, are designated as such. “Now we can reject the fantasy that their parent institution is a political entity that is somehow separate from these violent activities,” the Texas senator added. If the Senate passes the bill, the State Department would have 60 days to issue a statement whether or not it agrees with the terrorist designation, The Hill reports, and State would also need to decide if it would move forward with listing the jihadi group. If the State Department rejects the bill, it has to give a “detailed justification as to which criteria have not been met,” the bill reads.